A woman after our own hearts, Coco Chanel loved her pearls. As did Grace Kelly, Jackie Kennedy, and Lady Sarah Churchill. Pearls epitomize grace and classic beauty. June’s modern birthstone have a lustrous shine with hints of silver, gray, and pink hues that changes under different lighting. It is a living jewel that formed in the mouths of oysters, mollusks, and even clams. Pearls can come from waters all over the world like the gulf of California, the Persian Gulf, the South China sea, and the Australian Indian ocean. Pearls are grown inside oysters and mollusks. It is a fascinating natural process that begins with a grain of sand or other foreign substance becoming lodged inside the shell. This single grain of sand is coated with nacre, a substance produced by the oyster, which coats the sand layer after layer. As time goes on, a natural pearl is formed inside the oyster shell. This process takes an average of eight years for the pearl to fully develop. In addition to being the birthstone for the month of June, the pearl is also a modern wedding gift for couples on their 3rd, 12th and 30th wedding anniversary. Freshwater pearls are the traditional gift for the 1st year wedding anniversary. At one time, natural pearls could easily be found in the Persian Gulf, but unfortunately most of those pearls have already been harvested. The discovery of oil in the Persian Gulf has also dampened the desire to harvest natural pearls. Furthermore, Mikimoto’s introduction of culturing pearls sharpened natural pearl hunting’s decline. Cultured pearls are created with the help of man. A piece of mantle tissue or a round bead is inserted into the mollusk by hand to spur the pearl-creating process. It is difficult to tell the difference between natural and cultured pearls. Cultured pearls can take anywhere from 6 months to 1 year to form. Experts often have to use x-ray to identify the difference between cultured and natural pearls. Pearls can come in several different colors. The most common is the pearly white or cream color. 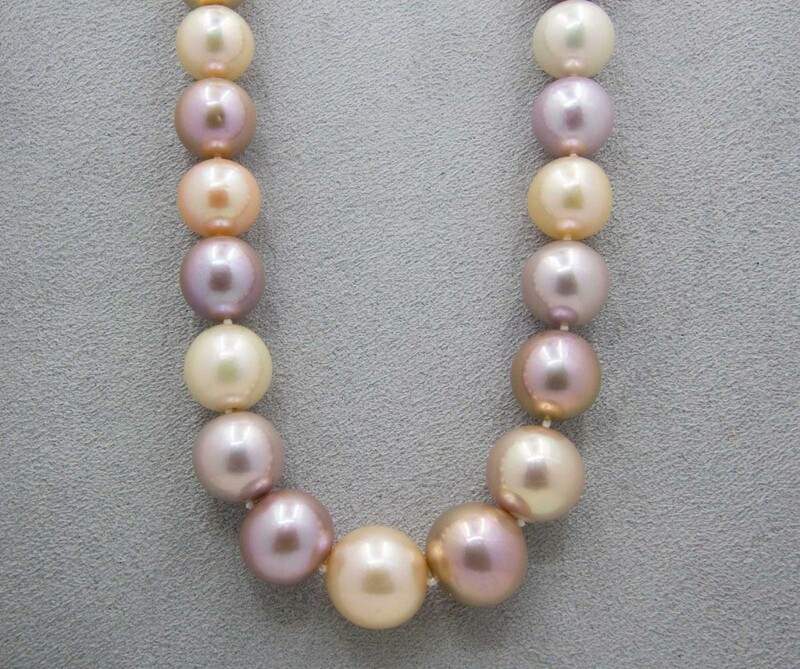 Pearls can also be pink, lilac, and different shades of gray. Some of the most sought after and most expensive pearls are the South Sea pearls, which are gold in color and the Tahitian pearls in a lustrous black. Freshwater pearls are formed the same way, but usually in lakes or canals where freshwater and salt water come together. Freshwater pearls are usually oblong, and of various shapes. They are not smooth and round like the pearls found in salt water oysters. Pearls are graded on their size, luster and color. Perfectly round-shaped pearls are more expensive, but luster and color also play a huge part in the grading process. Flaws are also taken into consideration. 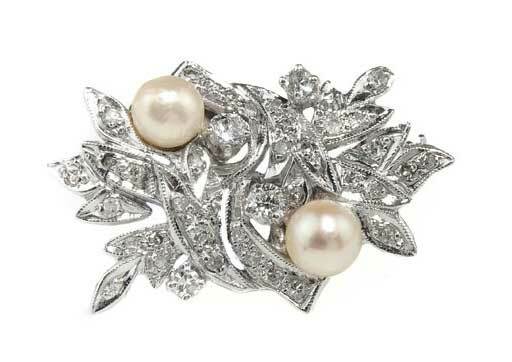 Pearls have been considered a popular stone of choice by women for many centuries. The iridescent and lustrous shine is the main feature that allures women to this gemstone. The pearl also carries many legends that have been passed down through the years. These stories tell us just how worshiped and respected the pearl was in ancient times. The Greeks thought that wearing pearls would promote happy marriages without any tears being shed by the wife. They also believed that pearls were the tears of the Gods. The Chinese tell stories of pearls falling from the skies, and are thought to only occur when dragons fight. Pearls are one of the most unique stones that are popular today in modern jewelry designs. The pearl is a symbol of love, and looks regal in a specially designed necklace or earring made only for you. Our jeweler has the expertise to design any type of ring you are looking for. Call us today at 619-223-2151 or Contact Us here to make an appointment!